We've all seen the unordered desks of great scientists, a great proof that keeping things tidy isn't necessary to be a genius. How's your desk? Make sure you take time to keep things clean and tidy! But is it? We've also heard that smoking doesn't necessarily cause cancer, even though it most certainly contributes to it. 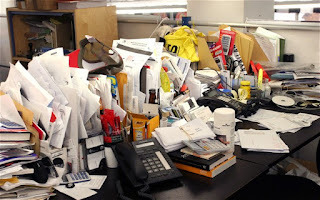 Actually a study showed that keeping tidy is beneficial: "having a clear, and clearly labelled, system, one that is likely to be more specific than an ‘In’ and ‘Out’ tray and is reasonably intelligible to others". This way you'll make space and time for new projects, ideas and success!